It’s dim, he admits, but your eyes easily adjust because the light is even throughout the room. With no lights switched on, no energy is used, and the small skylights allow little solar gain (additional heat from the sun). Even when the lights are on, they seamlessly integrate with the ambient light. Kelly and Rezeli speak with a passion that draws one into their world of thinking. Their opinions aren’t pushy or condescending; they genuinely want to educate others about having a smaller impact on the natural environment. That’s the mission of their firm, and of their personal lives. The couple launched Re:Vision Architecture out of their home in 2001. Since then, the firm has grown to 15 employees and a branch in California. They have designed more than 60 LEED-certified projects (LEED is the standard developed by the United States Green Building Council [USGBC] to measure green building practices). They earned the first and second LEED Platinum certifications, the highest award USGBC gives, in Delaware, and in Pennsylvania, they’ve worked on seven LEED Platinum commercial and eight LEED Platinum home projects. They also helped found the Delaware Valley Green Building Council, which, like Re:Vision, has just reached the 10-year mark. In 2008, they designed, in collaboration with Roofscapes, Inc., perhaps their best-known project in Philadelphia: a 45,000 square-foot green roof on the PECO building. The roof soaks up roughly 1.5 million gallons of rainwater runoff annually. Other recognized Philadelphia projects include eco-renovations for the White Dog Cafe, the renovation design for the Mariposa Food Co-op and the Fair Food Farmstand at the Reading Terminal Market. Re:Vision’s staff and projects have received numerous green building and sustainable business awards—most recently a nomination from Bloomberg Businessweek for America’s Most Promising Social Entrepreneur for 2011. And, of course, they’ve turned their office space, a former stable, into a model of smart, efficient design: radiant heating in the floors, bamboo workstations, skylights throughout the building and open-air flow. Kelly, 43, the firm’s principal architect, and Rezeli, 38, the managing principal, approach their for-profit operation with a nonprofit mentality. The clients, developers, contractors and code officials on their projects are all involved from the very beginning. And they continue monitoring their buildings long after they’re built. They even educate their clients on how to best use the space by analyzing utility bills. Rezeli’s enthusiasm for the environment stems from her upbringing in a family with a Depression-era ethos. After graduating from the University of Notre Dame, she took a job in the nonprofit sector, working on conservation projects and urban planning projects. She led students on energy audits of their schools, daylighting projects and stream-cleaning expeditions. Kelly’s impetus to start the business came from a cross-country drive he took in 1996. He had visited a small-town café in South Dakota five years prior and loved their soup. On the 1996 trip, he went 400 miles out of his way to return to that café, but it was gone. Most of the businesses surrounding the former restaurant were boarded up as well. Originally from Lower Merion, Kelly had been doing historic preservation—finding new uses for old schools and churches—but felt he could be doing more. When he was sitting on the local board of advisors for Earth Force, the nonprofit organization where Rezeli served as national director, the two spoke and hit it off. In more ways than one—the couple’s second child is due in late October. The firm began small, with only a handful of projects. 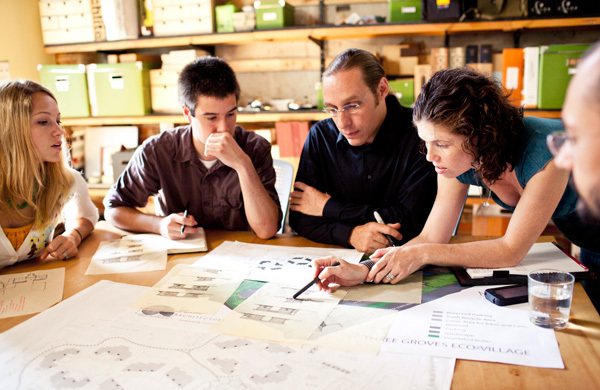 They often shared their green expertise with other design firms—essentially working with their potential competitors. In time their reputation, and business, began to grow. Jackie O’Neil approached Re:Vision in 2003. She knew that she wanted to build a pair of sustainable homes in Perkiomenville at market rate, but that’s about all she knew. Kelly and O’Neil sat down, discussed goals and went through building models. Everything was tested, and results discussed. The ultimate design came through collaboration. “They did a great job of helping me focus on what we could do to build a green home,” O’Neil says. The results were the first two LEED-homes projects in Pennsylvania. They are zero energy, passive solar structures with radiant heating under concrete floors and a solar panel array that produces 5kW of power. Rezeli and Kelly debriefed at O’Neil’s home a few weeks after she moved in, further bonding over dinner. Their working relationship has grown into a friendship, and has spawned more business—Re:Vision is currently partnering with O’Neil on a 37-unit eco-village development in London Grove, Pa.
Noack included his staff, the HVAC team, crane operators, Philadelphia University students, landscape architects and the Re:Vision crew in the design process, with Rezeli leading the charrette, a collaborative session where designers discuss how to solve a problem. Around 30 to 40 people gathered every day for one week to envision Aerzen’s new, 42,000 square-foot office building and light manufacturing plant. The facility features a geothermal heating and cooling system, and straw bales in the walls for insulation. The education process at Re:Vision starts with the clients, but goes through the developers, contractors, policy makers, end users and even back to the firm. They are constantly learning. He says that he often walks into construction meetings, picks up a tube of caulk and explains why he wants them to use that brand. Then he hands them the caulk and walks away. He sees the light bulb go on in their heads when they think about their fathers and brothers suffering from cancer. In Philadelphia, Re:Vision championed the waterless urinal system at the Comcast Center. The plumbers union originally opposed a building code change that would allow the waterless system. “Anytime you’re doing something officials don’t typically see, you’re going to have to do additional education,” Kelly says. Kelly pauses and notes that in that project they were representing Liberty Property Trust, the developers of the Comcast Center, with whom they have worked on several projects. Builders in the U.S. were once environmentally conscious because they had to be, Kelly explains. Then, about 50 years ago, glass became inexpensive. Energy prices dropped. Projects were built that didn’t factor in natural systems for light and heat. Instead, construction began to rely on mechanicals. “The best architecture uses natural systems to its fullest abilities,” explains Kelly. It’s that simplicity that Re:Vision employs today—cisterns and rain chains to collect stormwater, proper site alignment, vines serving as living walls, skylights, proper ventilation, water in the walls as insulation. Seibert and his brother are planning another project with Re:Vision in Queen Village.